packers with plates of chicken fried rice and banana pancakes, to luxury-hotel outlets serving New Zealand lamb shanks and sushi crafted from fish flown in direct from Tokyo. 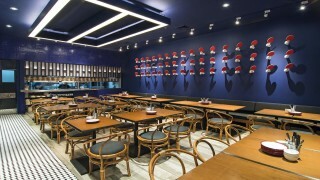 Recent years, however, have seen the emergence of a new breed of independent-minded chefs using their global experiences to shake up the status quo, with an emphasis on seasonal and locally sourced ingredients, melding foreign tastes and Thai flavors, and laying the groundwork for Phuket’s next culinary chapter. 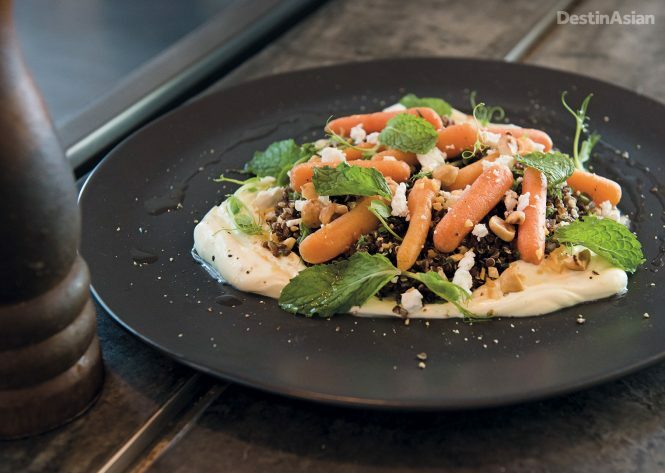 A dish of glazed carrots, quinoa, crème fraîche, hazelnut, and orange zest; Photo by Jason Michael Lang. Opened last year at the southern end of Phuket’s prime party town, Patong, Rustic Eatery & Bar is a quietly sophisticated addition to the scene, with whitewashed walls, open-air seating, and a seaside vibe that could have been plucked from the Dalmatian Coast of Lesar’s homeland. Relaxed yet smart—think dangling Edison bulbs and polished concrete floors—the restaurant comes into its own at dusk, when the sunset bathes the interior in a soft glow. Menu-wise, Rustic showcases the young chefs’ passion for experimenting with Asian and European flavors, as epitomized by such innovative dishes as black fettuccine with chili jam and grilled octopus; beef cheeks slow-braised in soy and sake with daikon puree; and torched scallop carpaccio with oranges, mint, and pink peppercorns. There’s also plenty of comfort food—gourmet hamburgers, brick-oven pizza, porchetta—as well as Surajaroenjai’s fabulous desserts, which include mango crème brûlée and passion-fruit macarons. 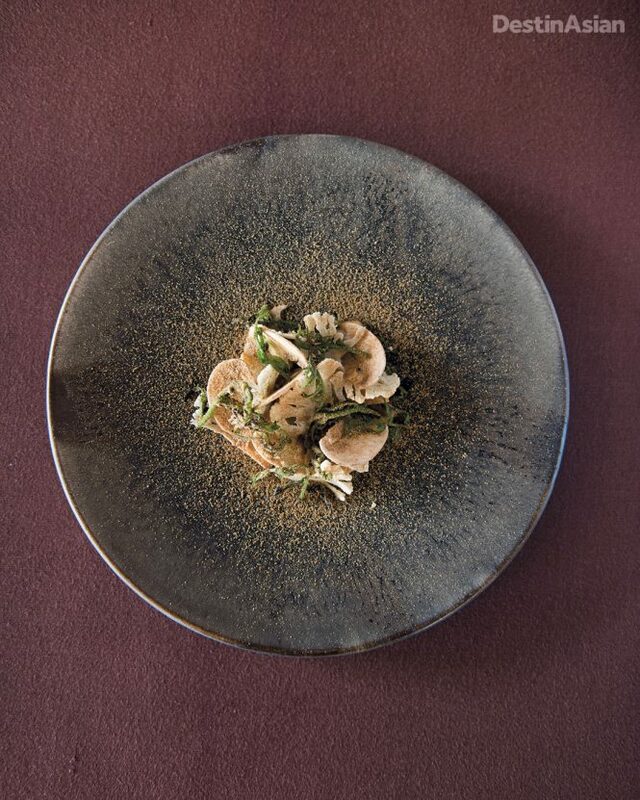 On the farm-to-table menu at Pru restaurant, a dish of roasted cauliflower stem in brown butter with foraged mushrooms, bone marrow, grilled fiddleheads, and sardine powder; Photo by Jason Michael Lang. The result is PRU, which opened earlier this year inside a teakwood pavilion on Trisara’s lush grounds. The name is an acronym for “plant, raise, understand,” and the menu is an assemblage of correspondingly complex yet simply named dishes like “Oyster”—butter-roasted celeriac with steamed Surat Thani oyster, caramelized-onion broth, and foraged spring onions—and “Carrot,” which combines pit-cooked carrots, a hollandaise sauce made from fermented carrot juice, and cured egg yolk from chickens raised at Trisara’s farm. It’s a bewildering but delicious creation that imbues the humble root vegetable with a smoky, almost bacon-like quality; Ophorst calls it “the perfect carrot.” Other dishes showcase quail from Chiang Mai, Isan lamb, and wild-caught seafood, be that lobster, abalone, black crab, or the fish that appears in a glistening crescent of yellowtail tartare alongside sea grapes from the shores of Phuket’s Cape Panwa Peninsula and osetra caviar harvested in Hua Hin. PRU’s locavore sensibilities, it’s worth noting, extend beyond the kitchen. The bread and butter plates on the dining room’s linen-draped tables are made from broken pieces of stone from a nearby stone factory. And some dishes, like the Chiang Mai quail—served with grilled fiddlehead and a spinach-bamboo emulsion—are plated on polished rounds of driftwood washed ashore by the Andaman Sea. It’s enough to inspire some beachcombing of one’s own. 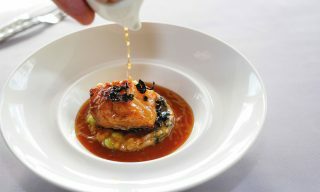 Bampot’s chef Jamie Wakeford; Photo by Jason Michael Lang. 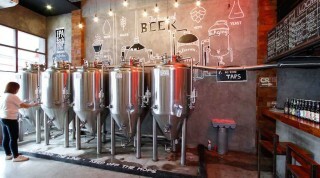 His first self-owned restaurant, Bampot, opened in 2014 in the upmarket enclave of Cherngtalay on the island’s northwest coast, and immediately caused a stir among local foodies. The setting was part of the attraction—a traditional shophouse given a modern makeover, with large windows bringing light into the high-roofed space, and an open kitchen running down one wall, where you can observe the chef’s process and technique up close. At one end, a backlit bar invites patrons to sit at the counter, where staff clad in light-blue aprons that recall the nearby ocean whip up cocktails with fun names like the Myanmar Margarita: a heady muddle of tequila, fresh mango, chocolate bitters, and chili flakes. The food, however, is the main attraction. Wakeford’s roster of contemporary comfort fare includes an upmarket (and irresistible) take on the classic American mac and cheese—he packs it with Maine lobster—and beer-can chicken in red-wine jus that uses local organic poultry. Another standout? Grilled squid plated with saffron aioli and an artful smear of ink. The menu has been such a hit that Wakeford—who has just become a father for the first time—plans to open an offshoot of Bampot in Bangkok before the end of the year. Suay’s signature mango sticky rice spring roll with black-sesame ice cream; Photo by Jason Michael Lang. 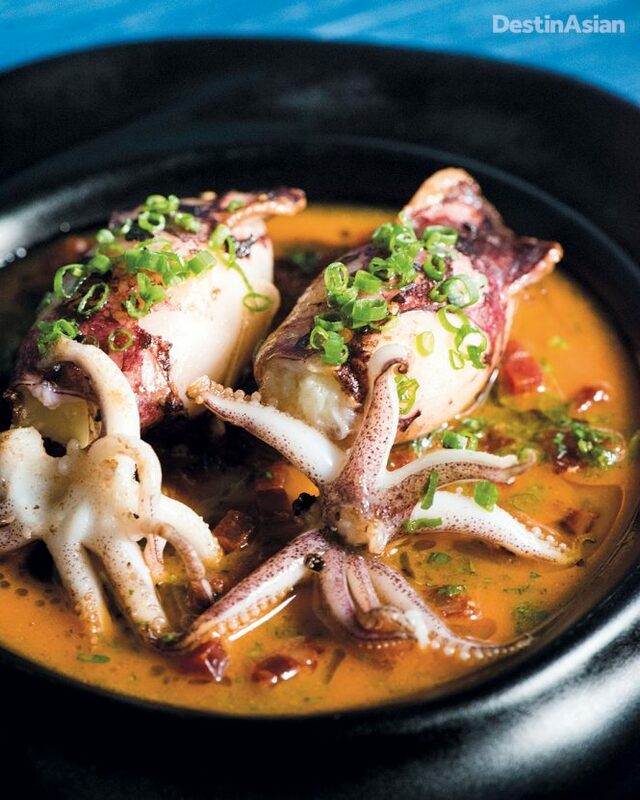 Chef Noi, as Tammasak Chootong is known around the island, has a curious story to tell. Born just north of Phuket in the neighboring province of Phang Nga, he moved to Germany as a teenager with his mother and stepfather. Arriving without a word of German, and even less English, he ended up learning both and then, after finishing school, found work as a waiter in a Michelin-starred restaurant in Stuttgart. Intrigued by the work of the chefs, he talked himself into a kitchen job plating dishes and prepping vegetables, before embarking on a colorful cooking career that took him from restaurant to cruise ship to five-star hotel. Eventually, he was drawn home. In 2010, Chootong launched Suay—the name means “beautiful” in Thai—in Phuket Town, then a dining backwater peopled with elderly residents. It was a brave move to open so far from the hotels and tourist crowds of the west coast, but a combination of setting—a charming single-story house with a wraparound veranda and white picket fence—and creative European-Thai fusion dishes won Chootong a loyal following, not to mention a spot as resident chef on Iron Chef Thailand. 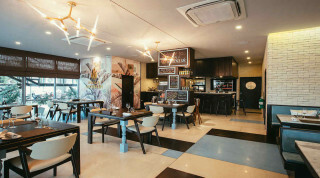 Perennially popular creations such as spicy tuna tartare and quiche Lorraine made with Phuket crab have helped the chef expand his culinary empire to include a catering service, cooking school, and a soon-to-open second branch of Suay in Cherngtalay, not far from Bampot. “The dining scene has changed a lot since we first opened,” Chootong says. “Previously, Suay drew mostly tourists. 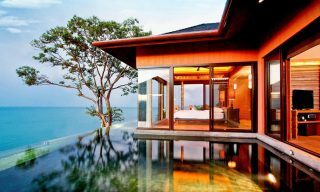 But now, islanders have become more interested in fine dining, in eating something unique.” To judge by the convivial crowds who descend on his dining room most nights, there also seems to be an endless appetite for his signature mango sticky-rice spring roll, presented with a dollop of black-sesame ice cream. 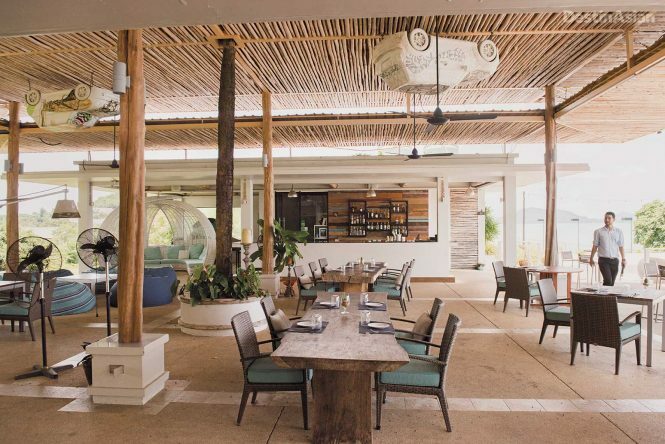 The alfresco dining room at Breeze at Cape Yamu; Photo by Jason Michael Lang. A 30-minute drive north from Phuket Town, Xavier Charest is part of an unexpected French-Canadian invasion: the lively 25-year-old is the second chef in a row hailing from Montreal to helm this stunning alfresco restaurant overlooking Phang Nga Bay from its perch on the lush Cape Yamu Peninsula. While it’s an incredibly romantic venue any day of the week, with its billowing curtains, bamboo-lined roof, and beckoning infinity pool, Breeze has achieved island-wide fame for its Long Lazy Sunday brunch, where 20 or so patrons are seated randomly at a long wooden table—the idea is you make friends with strangers—and served a selection of sharing plates accompanied by one of the finest wine lists on the island. 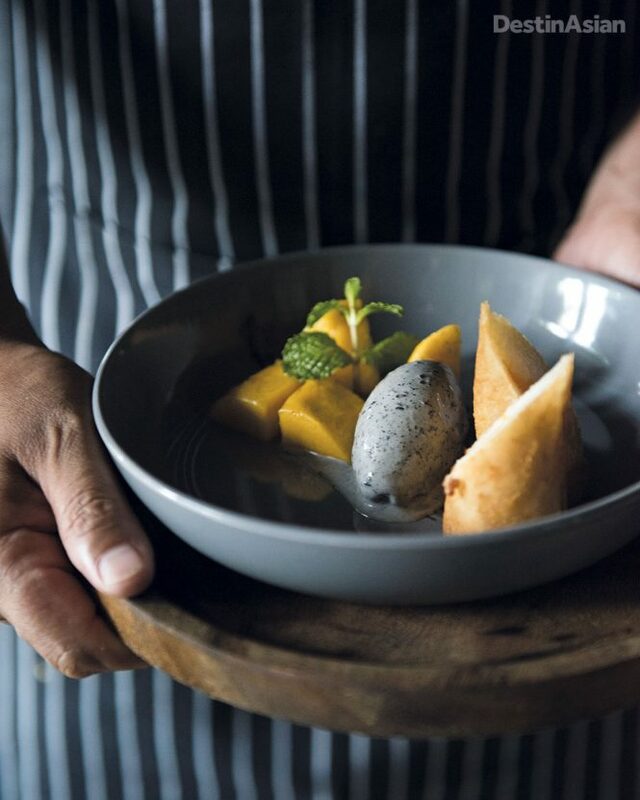 Charest, who says the first time he saw a beach was when he moved to Phuket three years ago, has acclimatized well to his new home, adding Thai-inspired techniques and ingredients to his repertoire. A constant innovator, he changes his menu weekly depending on the produce available at the local market as well as whatever new flavors he discovers on his culinary explorations of the island’s villages. Recent inclusions have been his take on crab in red curry, adding pumpkin to the classic Thai dish; homemade pasta served with Phuket squid in white-wine sauce; and a dubious-sounding but remarkably tasty duck breast with fried seaweed and herb salad. Local baby squid stuffed with brandade (an emulsion of salt cod and olive oil), chorizo, and piperade sauce. Lesar; Photo by Jason Michael Lang. 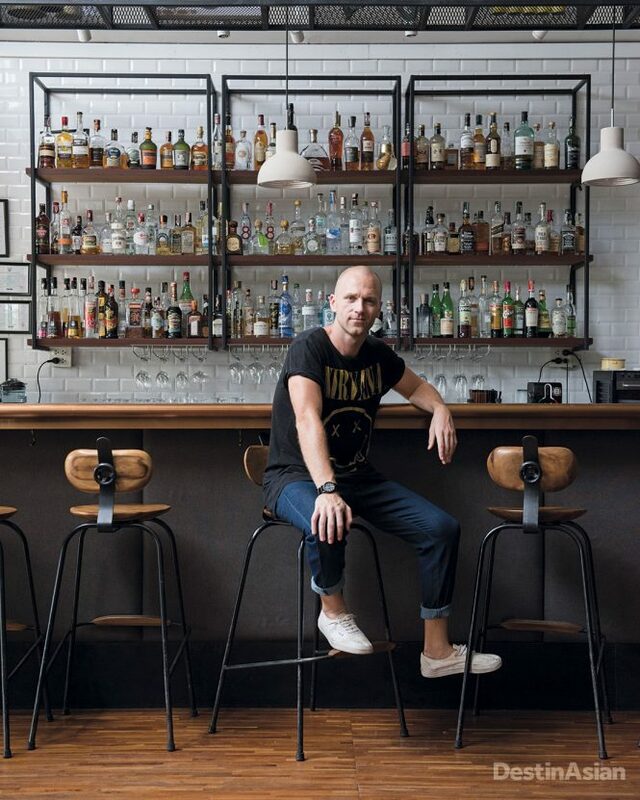 The latest arrival on Phuket’s culinary scene, Tim Butler has one foot on the island and the other in Bangkok, where he has been head chef of the award-winning Eat Me restaurant since 2010. “When it first opened in 1998, Eat Me was a gap-filler,” the 39-year-old American recounts. “At the time, Bangkok dining consisted of either high-end hotel restaurants or low-end local eateries, with not much in between. 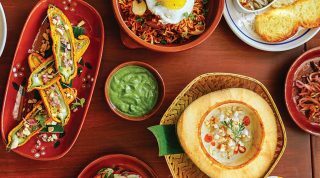 You either dressed up for dinner at the Oriental, or dressed down for street food.” Eat Me has since become a landmark that has managed to stay relevant, keep old customers, and attract new ones. exclusive location and marine-inspired decor—undulating blue waves cover the ceiling, while the waiting area features big starfish-shaped sofas—the place is anything but pretentious. “It’s formally informal,” Butler says. “Not too serious, but still definitely high-end.” That’s hard to argue with when you’re presented with succulent Spanish carabinero prawns, served in their shell with a delicate spoonful of watermelon, chili, and mint. Or perhaps the incredible scallops, harvested from the ocean off Hokkaido and paired with black truffles and a jamón ibérico broth. There is a determined focus on premium-quality seafood, sustainably sourced—indeed, when we talk Butler is already planning his next expedition: to oyster and wagyu farms in Shikoku, Japan. This article originally appeared in the October/November 2017 print issue of DestinAsian magazine (“Putting It All On The Table”).